This article is published in collaboration with . In August, Wendy and Chris Hogan called 911 after their 24-year-old son Andy stopped taking his medications for schizophrenia. Andy had hit his father at their home in Milpitas, California, and they were hoping to get help. Instead, deputies from the Santa Clara County Sheriff’s Office arrested Andy Hogan on misdemeanor assault charges and a probation violation. When he was booked, staff at the Main Jail’s Psychiatric Unit noted Hogan’s schizophrenia but determined that he could be held in general population at the Elmwood jail, one of the county’s three jails. 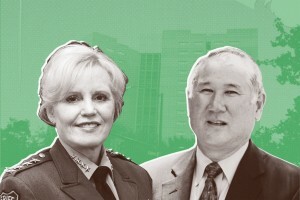 Santa Clara County Sheriff Laurie Smith and challenger John Hirokawa. Photo illustration by Anagraph for The Appeal/Photo via County of Santa Clara Office of the Sheriff/ Photo via John Hirokawa. On October 23, a settlement in Chavez v Santa Clara County was reached; the county agreed to improve medical, dental and mental health care and to change its use of force and solitary confinement policies, including a limit of 45 days in isolation for any single rules violation. This entry was posted in Features, News and tagged brutality/abuse, conditions of confinement, deaths in custody, elections, jails, medical care, mental health care, Mental Illness, Santa Clara County jails, sheriffs, suicides. Bookmark the permalink.